On September 19, 2017 category-5 Hurricane Maria swept across the Caribbean leaving a large swath of destruction in its path. Among the many locations affected by the hurricane, Puerto Rico experienced a direct hit with sustained winds over 150 mph for hours on end. Houses disappeared and whole forests were stripped of leaves. Trees, streetlights, telephone poles, and billboards were ripped out of the earth and strewn about the island. Many lives were lost during the violent storm, and even more succumbed to the hostile living conditions it created. It has been 5 months since this monster storm clawed its way through the Atlantic/Caribbean and the effects are still being felt. Most of the news coverage to date has focused on the humanitarian crisis, and the massive federal response to it; less attention has been given to the environmental component of this response. As part of FEMA’s response to Hurricane Maria, Matt Bissell (Solid Ambassador) with NOAA’s Emergency Response Division deployed on scene. 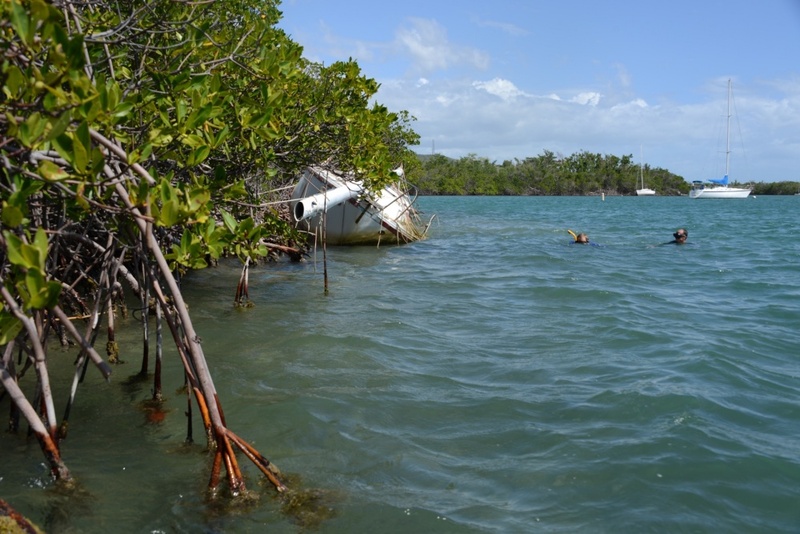 After the storm had passed, over 300 boats of various sizes had been blown into the mangroves, grounded on coral reefs, or sunk in the nearshore waters of Puerto Rico. Each of these vessels represents a potential environmental hazard; fuel and oil left onboard can be released into the ocean, batteries and appliances can break down and release toxic chemicals, and the boats themselves will eventually break apart leaving large amounts of marine debris. In the years to decades it would take for these derelict boats to break apart, they are not only eyesores, but they can cause other damages to the immediate area. With each additional storm, the movement of these heavy boats can trample mangroves and crush coral reefs. Working with the United States Coast Guard, NOAA provided Scientific Support in the removal of these abandoned and derelict vessels. Over the last 5 months, they have removed over 300 boats from the environment, helping return Puerto Rico’s beautiful coastline to its pre-Maria condition.